eileen @ FamiliesGo! on August 2, 2013 at 8:42 a.m. I remember going to Disney World in High school and saving my ticket because we didn't use the last day and it said it was good forever. I need to find it before our next trip and find out if this is really true! Lisa Goodmurphy on August 2, 2013 at 9:05 a.m.
What a great find! 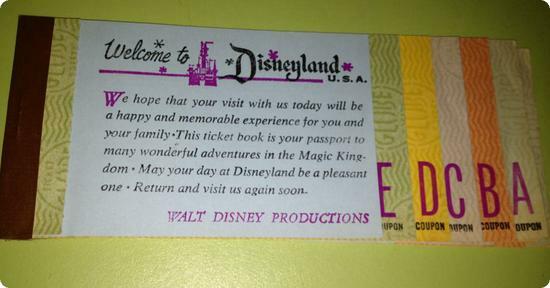 By the time of my first visit to Disney they were using pass cards that could be scanned - I had never seen a paper ticket before. A on August 2, 2013 at 10:49 p.m.
Haha those tickets always made me so excited! The Local Traveler on August 13, 2013 at 2:01 a.m. This brings back so many memories!! What a great photo Friday. I haven't done this before but I think I'll join in next week! Adam Shake on August 16, 2013 at 12:38 p.m.
Disney is on the bucket list, I never got to go as a child. Not sure how old is old enough to REALLY get the best experience... but eventually! Melanie on August 31, 2013 at 4:47 a.m. I initially thought that going to Disneyland as an adult would be kind of boring but I was wrong. I actually had a blast! Space Mountain was the best for me; I hope your family enjoyed it as well. The parades and fireworks also make the experience magical.